An Overland stage (celerity) wagon of the type that would have carried express letters (i.e., mail), small cargo and hardy passengers across the Santa Clarita Valley beginning in the 1850s. This example is on display (2012) at the Frontier Homestead State Park Museum in Cedar City, Utah. According to the museum signage, this wagon saw service in the Four Corners area in the late 1800s. 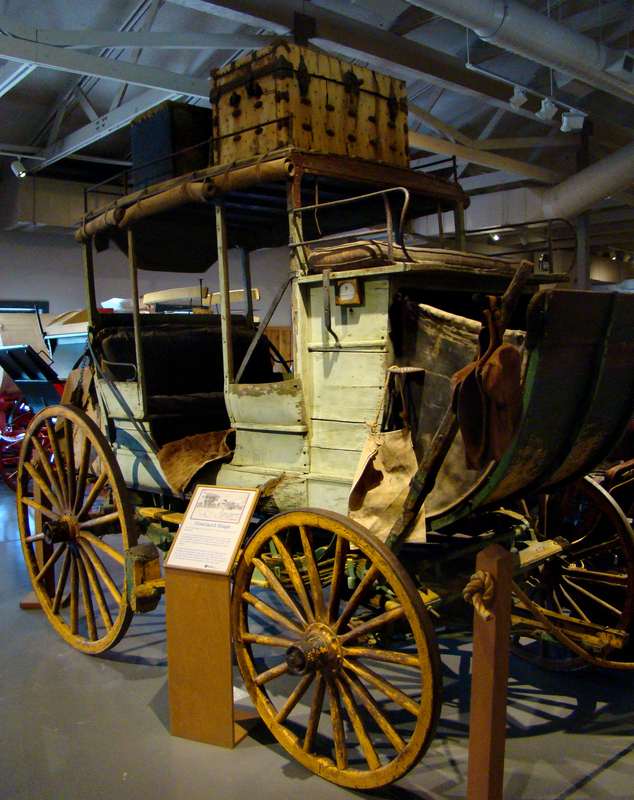 Nicknamed "mud wagon" because it was heavily used on muddy routes which, not long past, were Indian footpaths and Californio horse trails, a celerity wagon cost about $600 and could seat seven to 12 passengers, depending on the style. It was a lower-cost option to the Concord coach, which cost about $1,100. (Think "Wells, Fargo stagecoach" and you're probably thinking of a Concord.) Lightweight and durable, the celerity wagon was usually pulled by a team of four horses. The biggest manufacturer of both types of wagons was the Abbot, Downing Co., which was started in 1827 by J. Stephens Abbot and Lewis Downing in Concord, N.H. (thus the brand name of one of their coach types). Butterfield Trail historian Kirby Sanders notes that Butterfield's Overland Mail Co. wouldn't have used this coach because it has only two passenger benches. Butterfield required three. It must have been used by a different express company. Gerald Ahnert adds: "(This wagon) is distinctly different from Butterfield's design in many ways. The most important, for identifying a Butterfield stage wagon, is that the driver and conductor's seat are on the same level as the passenger's seats. As you can see (in this photograph), the driver's seat is well above the passenger seats. Also, Butterfield's stage wagons weren't capable of carrying any luggage on the top, as it was merely a thin canvas supported by wooden staves." Also, according to Sanders, the trunk seen on the roof wasn't standard issue for either Abbot, Downing or for its chief competitor, Troy Coach of Troy, N.Y. It would have been added by the coach operator. Two technological advancements, in particular, sidelined stagecoaches and ultimately rendered stagecoaches obsolete: the introduction of the telegraph in the 1860s, which diminished some of the need for written correspondence; and the arrival of the railroad. LW2439a: 9600 dpi jpeg from digital image 5-13-2012 by Leon Worden.